One of the great things that came from our 'Walls have Ears' Project was the discovery of Forest Recycling Project (FRP) based in Walthamstow. With a 100m long wall to paint we knew that we had to find a way to keep paint costs low so we were delighted when a friend introduced us to FRP, a not-for-profit, social enterprise with environmental and social aims. The soon to be re-named 'RePaint' faction of FRP collects surplus, leftover paint from Re-use & Recycling Centres and commercial companies. The paint is then sorted, quality-checked, re-mixed if need be, and sold as a value alternative to new paint, particularly for lower income customers, community groups and not-for-profit organisations. 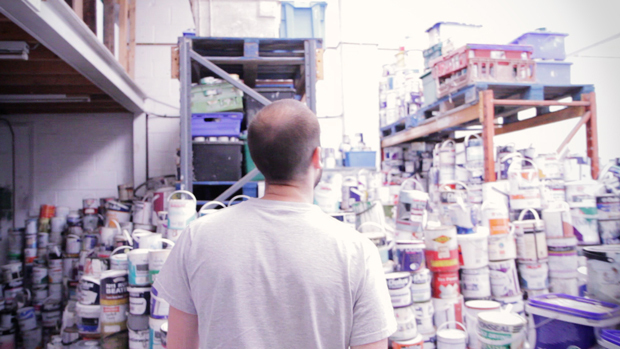 When you enter the warehouse you're greeted by mountains of paint cans and although it might take a bit of looking you'd be hard pressed not to find what you're looking for. We loved the ethos of the place and it fitted perfectly with our project enabling us to buy all the paint we needed at a fraction of the cost. We are delighted to be painting a mural outside RePaint this Saturday and urge you to pop down sometime to have a look and buy some paint!